Dunfermline Abbey Church was built over the foundations of an earlier church on the same site. Work started in 1128 and was finished in 1250 although changes to the structure continued several hundred years after this. Only the nave of the original church survives, the rest of the church dates from a later period. 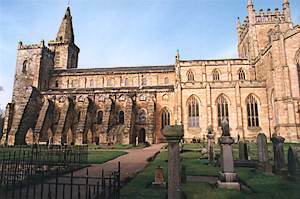 Dunfermline Abbey is in the care of Historic Scotland and there is an entrance fee to the Abbey ruins. It is is open all year round but is closed on Thursday afternoons and all day Friday during in the winter months. Entrance to Dunfermline Abbey Church, where the filming took place in The Bruce and Macbeth, is free.